Below we shall look at some of the most frequent causes for ankle or heel pain and you will learn how you may start your journey to becoming PAIN FREE 100% naturally without the use of drugs or steroids. Is ankle pain or heel pain stopping you from jogging… playing sports… wearing your favourite pair of shoes… or even stopping you from properly walking any distance? Common Causes of ankle and heel pain. It can be said that most ankle and heel pain causes fall into four main categories: tendon tear or inflammation (bursitis or tendinitis), instability, wear & tear or fracture. One of the major causes of ankle pain is due to an overuse injury of the Achilles tendon. This is known as Achilles tendonitis and you will usually recognise this injury by the sharp stinging pain that greets you as soon as you place weight on it in the morning. Many cases of Achilles tendonitis occur because of the wearing of tendon resulting in small micro-tears. Degenerative changes such as wear & tear can also cause Achilles tendonitis. 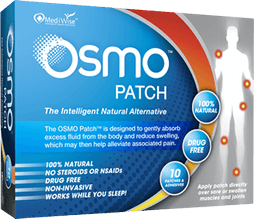 For further information and to discover how the OSMO Patch can help relieve swelling and the associated pain due to medically diagnosed Achilles tendonitis simply click on the link below.